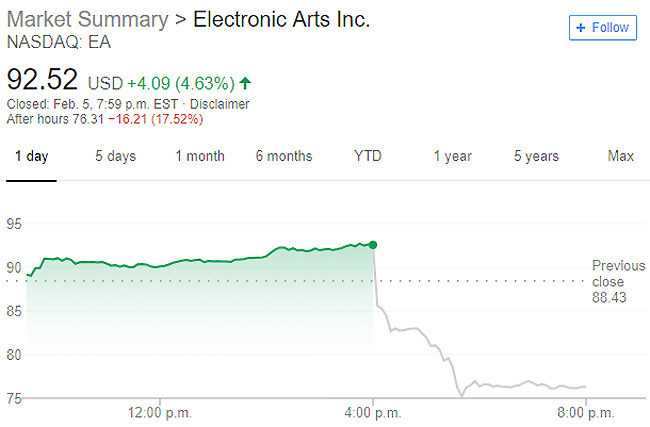 Electronic Arts (NASDAQ:EA) have released their Q3 results for the fiscal year ending March 31, 2019, and the mega publisher did not have a very merry holiday. Granted net income was actually up from the same period last year — $262 million vs. a $186 million loss – but that’s largely because EA was hit with a major one-time tax bill in late 2017. Still, the results were well below what analysts were predicting, leading to one of the biggest EA stock plunges in a decade. Share prices dropped over 17 percent, although they’ve since rebounded slightly. For the second holiday season in a row, EA is having to make excuses for a DICE-developed shooter – in 2017 it was Star Wars Battlefront II and this year Battlefield V fell short. Granted, Battlefield V sold 7.3 million copies, not a bad number by any measure, but EA was hoping to sell at least a million more. The game also didn’t drive as many Origin Access Premier subscriptions as expected. 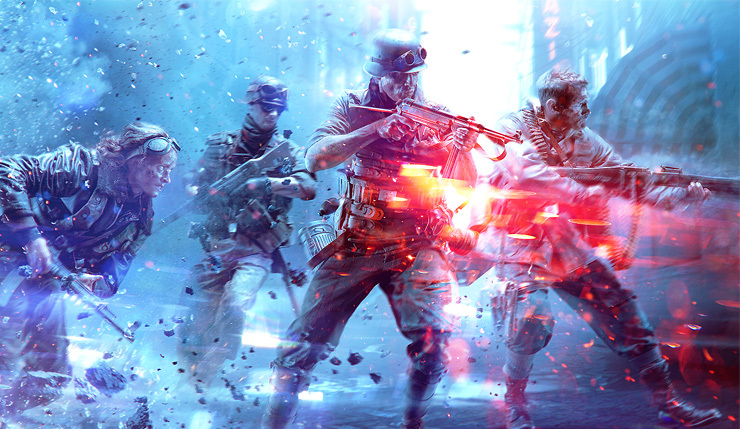 EA has mainly blamed this shortfall on the one-month Battlefield V delay and the fact that some features, like the Firestorm battle royale mode, weren’t available at launch. No doubt, those decisions had an effect, but you have to wonder if/when DICE will be held accountable for falling short on these big projects. 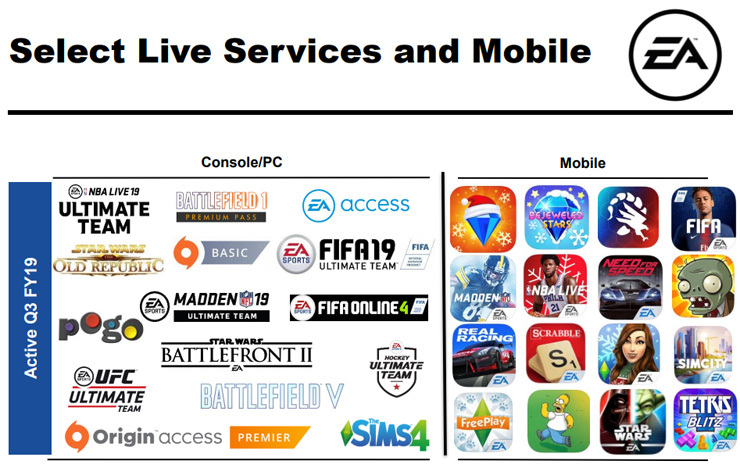 For some time now EA has been trumpeting the power of digital sales and microtransaction-driven “live services,” but overall Q3 digital net bookings were down 3 percent year-on-year. Good old reliable FIFA Ultimate team was up 6 percent, but that was offset by a drop off in Battlefield 1 business, the disappointment of Battlefield V, and a major 22 percent year-on-year decline in EA’s mobile business. EA blames their mobile woes on the delay of an unnamed game (likely Star Wars: Rise To Power) and the slow uptake of Command & Conquer: Rivals. Will Apex put EA back on Top in Q4? “We made some calculated decisions that did not work as planned in Q3, and we did not execute well in other areas of our business. Against the backdrop of a very competitive quarter, the combination of those factors led to our underperformance. While we are disappointed with the results, we understand where our challenges are, and we are deeply focused on applying the strength of our company to address them going forward. EA is looking toward the stealth-released free-to-play Apex Legends and the upcoming Anthem to shore up Q4 2019, but neither is a sure bet. Apex Legends has been decently received, but it’s hard to say if its F2P structure will bring in the revenue EA expects, and Anthem, while fun to play, will probably be another rocky launch for developer BioWare. EA is also expecting Anthem to sell 5 to 6 million copies in Q4, which seems wildly overoptimistic given the game will only be on the market for about 5 weeks during the quarter. Given the uncertainty surrounding Apex Legends and Anthem, EA’s guidance of $1.163 billion in net revenue for Q4 seems mighty iffy. As for fiscal year 2020, all EA could really point to were new entries in their bedrock sports franchises – EA may have a hard road ahead of them.